The hint of warmth in the air means that the Brooklyn Bridge is about to become its annual springtime shitshow. The Department of Transportation and other city officials have said for years — 2012, 2016 and 2017 — that the pedestrian and cycling path in the middle of the fabled span should be expanded to accommodate the hordes of visitors and commuters. And when I say “hordes” I mean Genghis Khan, invasion-type hordes. I don’t mean a few selfie-taking tourists. 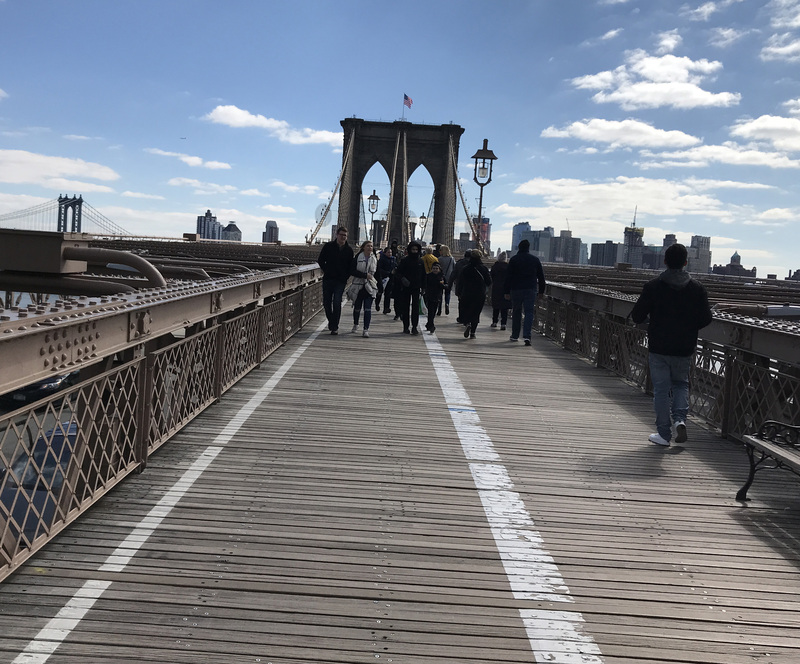 It got so bad during the holiday season last year that even the Times, which covers local transportation issues like Streetsblog covers Ebola outbreaks, reported that the bridge footpath had reached its “tipping point” (which is a scary metaphor for a bridge!). Police even closed the walkway intermittently during the Christmas rush last year. But the DOT has long been saying that it can’t repair the problem until a “cable inspection” is completed in 2021. Certainly, a full-scale, expensive capital improvement [PDF] won’t happen for years, but there’s no reason why the city can’t undertake simple changes to make the bridge function better for the car-free majority squeezed into a path that is simultaneously a world treasure and supposed to accommodate cyclists and pedestrians, yet is 10-feet wide in several places. It’s absolutely absurd that pedestrians and commuters have to share space with illegal vendors, hawking souvenirs, sunglasses, “No Stupid People” signs and, yes, locks that the lovelorn affix to the bridge (only to have them cut off by city work crews). That was more than 15 months ago. 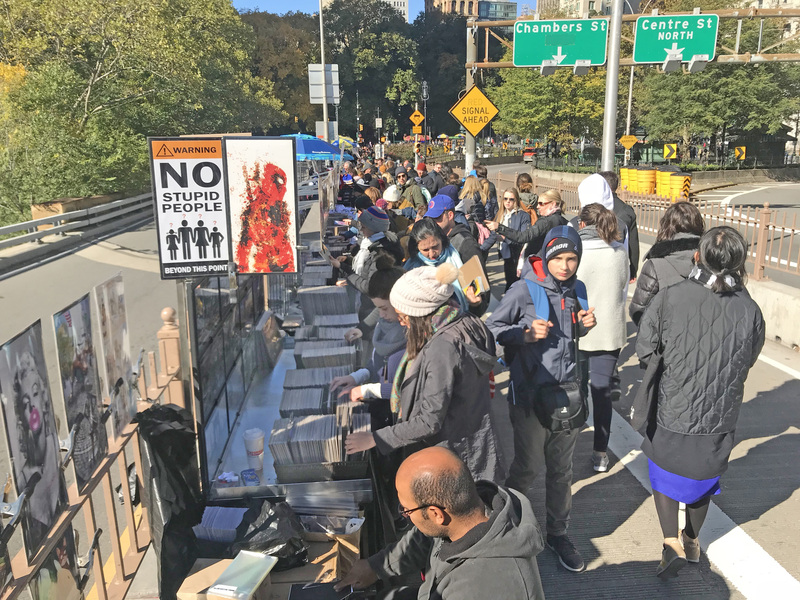 Vendors still lay down dropcloths from the entrance to the footpath on the Manhattan side to about halfway up that first incline — and they also circle the bridge towers, and have established marketplaces at other points on the footpath. They are simply in the way. 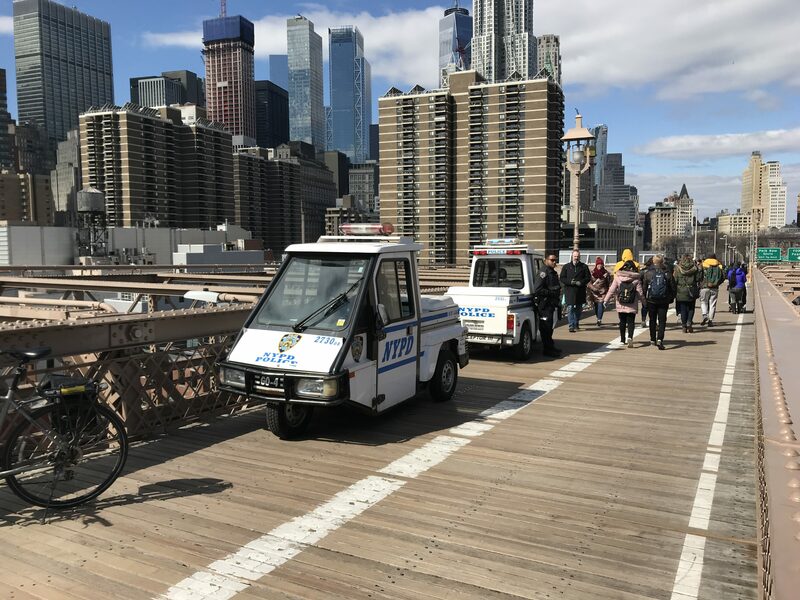 It’s an ongoing mystery why the NYPD parks four cars on the bridge footpath itself, given that the officers inside are almost always spotted playing with their phones. Occasionally, they help a tourist with a photograph. Putting aside whether the footpath even needs such a large troop deployment, is it too much to ask that they leave the large motorized vehicles in some placard-parking space on either end of the span? Mostly, the officers use small, three-wheeled scooters, but occasionally they give way to the so-called Smart cars. In either case, almost an entire lane of the already-too-narrow pathway is occupied. The biggest problem with the flow of bike and ped traffic on the footpath is that tourists have no idea where they should be (keep left, FFS!). That’s because there is virtually no signage indicating cyclist space and pedestrian space. The photo above shows how long pedestrians can go before they get a reminder that they are in the wrong place. In other portions of the bridge, the cyclist and pedestrian icons have completely worn off. On most of the path, they are faded to the point of suggestion to tourists that it doesn’t really matter where they go. So can we just please paint some new bike and pedestrian silhouettes? How much could that cost? And could someone replace the “Keep right” sign that’s covered in graffiti (see photo, right)? It’s completely useless. And under day-to-day conditions, those guys in the three-wheeled scooters never do anything to help, either. At the very least, they should help direct traffic. 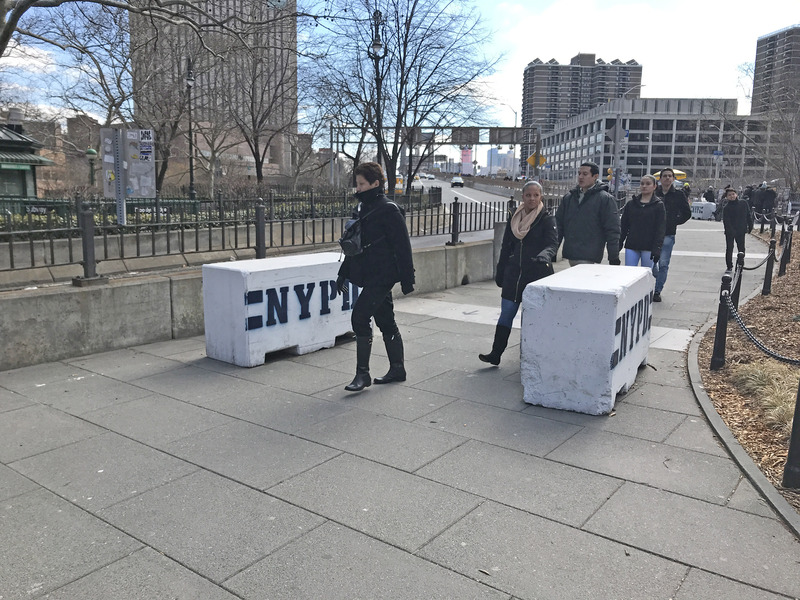 Last year, without warning or a specific stated reason, the NYPD dumped big blocks of cement at the Manhattan end of the footpath. They serve no purpose other than to steal more of the already-limited space from pedestrians and cyclists. And don’t argue that security makes these blocks essential — they are mere feet from existing security measures that render the footpath impassable to cars. Worse, the so-called sugar cubes only end up inhibiting people from riding or walking because they make such forms of transportation appear dangerous. There simply has to be a better way to protect exposed cables than to surrender several feet of precious space at the narrowest points in the bridge, as these cages do. In all, there are four sets of them — two horizontal and two vertical — and mostly they serve as a place for people to sit as they get their picture taken (see below). 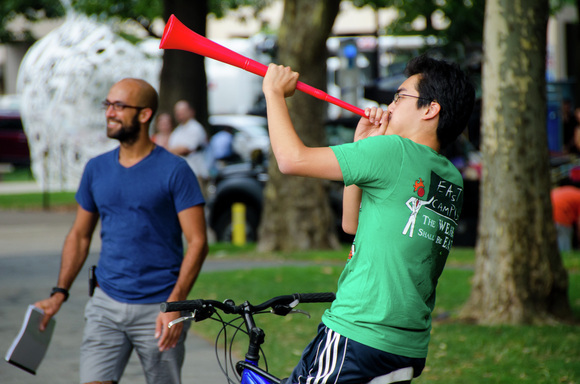 Then again, the DOT could just hand out vuvuzelas and just let us blow them for the entire length of the bridge. The bridge is completely full of people walking a lot of the time in warm weather. The extra deck proposed needs to go entirely to walking space. Cycling should be in a lane on the road deck, most likely the innermost lane on the south side. This may require a modification to the entrance ramp from northbound Park Row onto the bridge. Has the city studied this or did they only study the north side? Looks like my job will be moving downtown in April. Riding over the Brooklyn Bridge will be a big time and effort saving over my nine mile ride to Midtown — on the way in. On the way out Google says 6.3 miles and 39 minutes for the Brooklyn Bridge, and 7.1 miles and 50 minutes (with more elevation gain) via the Manhattan Bridge. It will be a little less because I’ll walk the bike a block to avoid going out of my way to West Street due to the one-ways. So the question is, will it cost me more than 10 minutes to get around the pedestrians on the Brooklyn Bridge. Forget about the mileage and the time. What you’ll save in stress alone by taking the Manhattan Bridge makes it all worthwhile. It isn’t so easy to get there, however. The bike infrastructure and bike parking are limited downtown. So I’ll have to see now safe I feel on a reasonably direct route. The MB is more or less a stress free joy ride. The BB is never not harrowing except very late at night. my radical idea is to ban bikes from like 8am to 8pm, April through September (OR turn over one lane of car traffic to bikes). I also think everything listed in this article should be done. But I’d also simply turn the walkway over to tourists and pedestrians during peak tourist and pedestrian hours. This is virtually the only situation in the entire city where I think reducing bikes is the best strategy, but the city simply has too much tourism these days, and now that Brooklyn has nearly fully gentrified, the BB is simply too much of a ped/tourist destination. On the assumption that you’ll be coming from south of the bridge, you can take Water Street / Pearl Street (Water becomes Pearl at Fulton Street), then turn right at Madison Street. Turn left at Market Street, then perform a little ziggety-zag at East Broadway, where you turn right (and go under the bridge), and then make an immediate left onto Eldridge Street. This takes you to Canal Street, where you turn left and go one block to the bridge entry. In practice I take the Williamsburg Bridge much more often; but when I elect to take the Manhattan Bridge, this route serves me well. Then allow bikes on the south side of the Manhattan Bridge, which is closer to Downtown, and put in a protected bike lane along the Bowery from St. James and Worth to the Manhattan Bridge. West of the Brooklyn Bridge. So, then, take Broadway down to John Street, go over to Water Street, and Bob’s-yer-uncle. That would take away the best view in the world of …the Brooklyn Bridge! You could always take your bike on the Ferry back to Brooklyn. Turn one motor lane over to bikes. 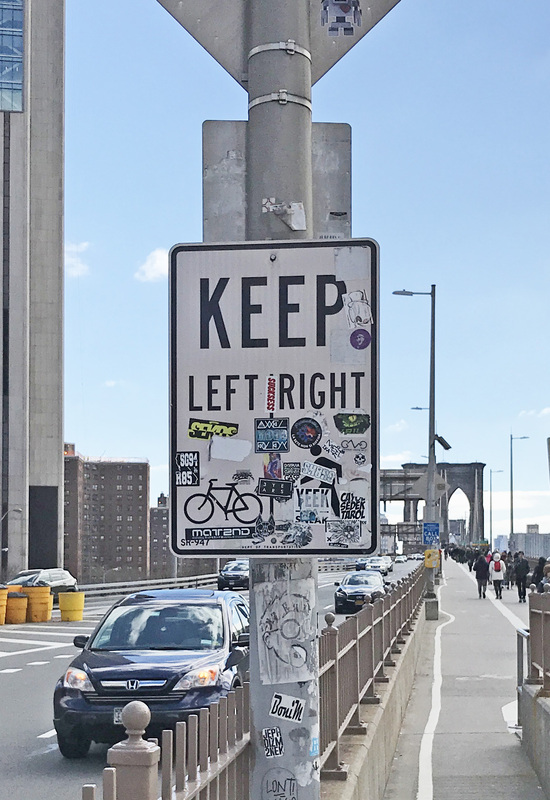 Allow both peds and bikes on both sides of the Manhattan Bridge, if bikes are to be removed from the Brooklyn Bridge promenade. As it stands, most peds are on the Brooklyn Bridge anyway, unless they are making a loop. What about the better fix of allocating a vehicle lane to bicycles and leaving the whole upper path (and all of it’s issues with vendors, police vehicles, boulders and pinch points) to pedestrians? Let’s get some concrete jersey barriers out and allocate one of the lanes away from motor vehicles to bicycles/scooters/skateboards! When I approach the Manhattan Bridge on Canal coming from the west side, I find it much easier to access the south side entrance to the bridge. I have the south side without police interference but it has always been off-peak hours when there are very few pedestrians. It would be convenient to be able as a biker to use both the north side or south side of the Manhattan Bridge. Imagine if we put signs up inside MoMA asking tourists to stay to one side to leave room for all the New Yorkers just trying to cut through from 53rd St to 54th St and you can get a sense of why “Help the tourists find their way” wouldn’t work very well. The rest of the solutions are fine even if not all of them are feasible. Yes, the city can and should move the vendors so there isn’t a massive bottleneck on the Manhattan side–that would have to happen even if the promenade was ped-only–but I doubt you can do anything about the cable cages. The only solution is to move bikes to the roadway. It should happen immediately. All excellent suggestions. Perhaps dispatch a colleague to one of the forums our Mayor is having in places like Iowa and New Hampshire. He’ll welcome the attention. Good and sad point. Northing but sweet deals for special interests — with the price for everyone else hidden until after an upcoming election — are likely to happen while a Mayor and/or Governor are running (or thinking of running) for higher office. That’s the precedent from Lindsay, Rockefeller, Pataki, Giuliani, Bloomberg etc. 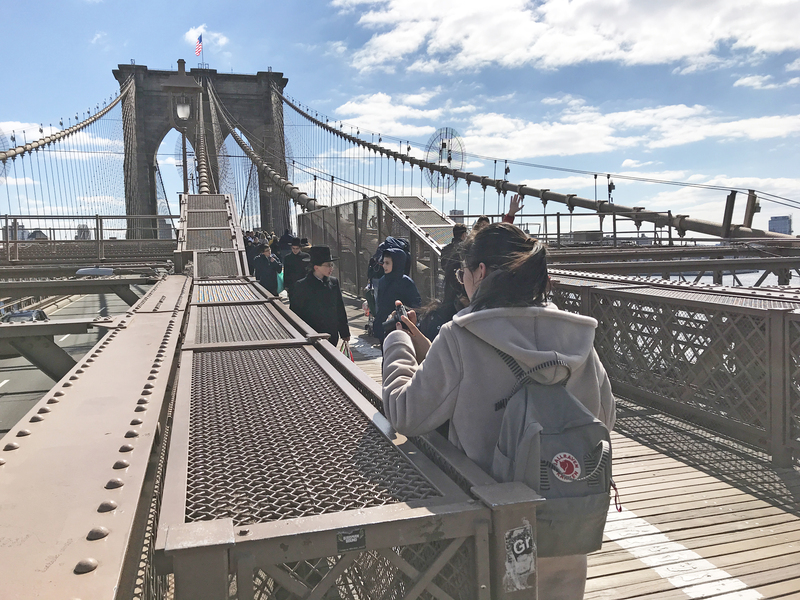 In 2016, the Brooklyn bridge handled over 17,000 crossings per car lane. 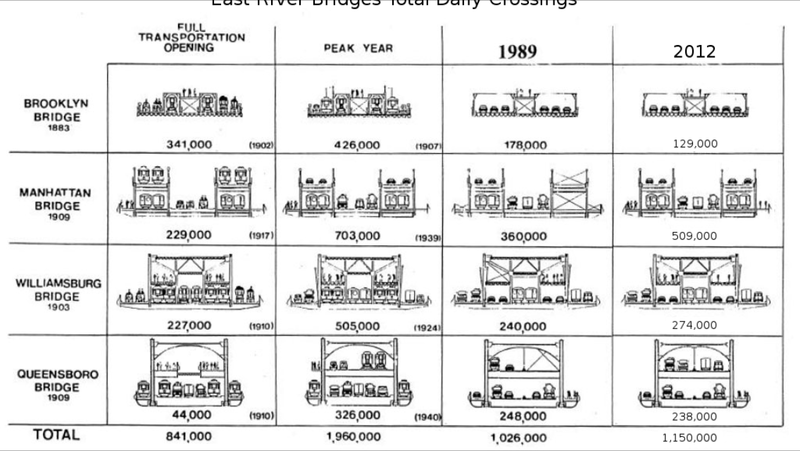 That year, DOT measured under 10,000 bicycle crossings of the Brooklyn and Manhattan bridges combined. The issue seems to be the bridge can’t take the weight of the jersey barriers. And I guess they don’t want to restall the steel cage that was there when the cable and then elevated cars went over 100 years ago. But if a car lane was dedicated to bikes the volume of bikes would skyrocket, easily past 17,000. Come up with a barrier design that weighs less. It is a solvable problem if there was a will to do so. During AM commuting hours the BB isn’t bad. So in the morning, it will be quicker. I’d probably go to the MB. I believe the NYPD stations cops in those vehicles there in case someone tries again to erect an anarchist flag atop one of the bridge’s columns. As you know, this is a dire threat to the city’s security (or maybe just a threat to the NYPD’s pride). But did you know that if someone is spotted erecting such a flag, those little vehicles can instantly turn into helicopters? Agreed. Ban bikes during the day. In theory the BB is more convenient for me but I never take it. But then put pressure on city to allow one car lane for bikes and scooters. I don’t think we need to open up the South Side of MB for bikers too. LOL! There are far more cyclists on the south side of MB than there are pedestrians on the north side. The one commonality that they share is that they’re equally indignant when you point out that they’re in the wrong spot. Sounds like bikes have 2-3 times the efficiency of cars on the BB. Perhaps we should reallocate 2 motor lanes to bicycles to increase through out of the BB. NYDOT should take one lane from cars to make a bidirectional cycle path. I think the vendors have the First Amendment argument in their favor, and you won’t be able to keep them off the bridge. Another issue that won’t get resolved with any of those suggestions is large tour groups. They can be anywhere from 15 to 100 people. I saw three buses filled with them stop at Cadman to enter the bridge last week. In the end there is no solution when that many people come at once but overall the city should not allow tour groups to exceed 20 persons. I think the solution is as suggested. Take half a lane on the roadway at the inner center part of the roadway on the bridge. This wont fly most likely. Or completely redesign the Manhattan bridge Manhattan bikeway exit so there is an easy southway and North way route & reduce the traffic light length at the end of the bridge on both ends . The best intervention would be to ask guidebook writers to remove all references to the Bridge. As recently as 10 years ago, the Bridge was known only to locals and the more adventurous visitor such as myself who was looking for something different, away from the selfie obsessed idiots at Times Square. Signs, regulation, widening of paths—none of them will work. I think cyclists need to surrender the bridge, at least on nice weekends after 8AM. If you think you’re going to make it across the bridge during peak tourist times by blowing a whistle then you’re as much a part of the problem as any of these obstacles. Just take the Manhattan Bridge and remember to stay on the north side. 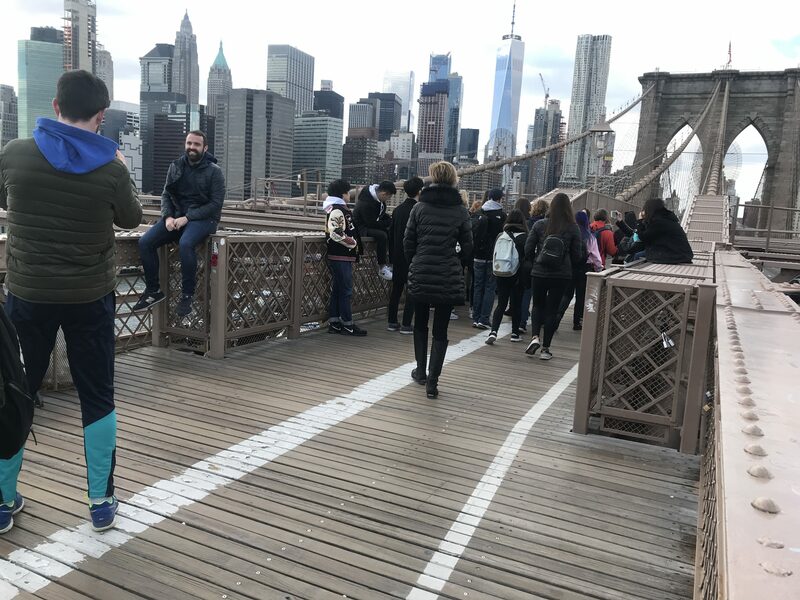 Mayor de Blasio and his police commissioner admitted on Thursday that they didn't do enough to ease dangerous conditions for pedestrians in Midtown and on the Brooklyn Bridge during the holiday season — and vowed to finally do more.